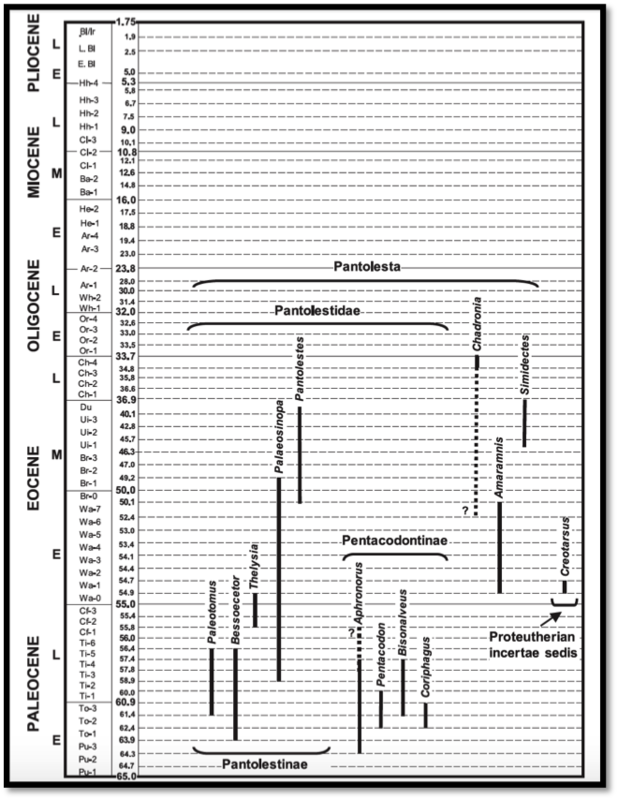 Stratigraphic extent of the pentacodontids (here subsumed within Pantolestidae) and “proteutherian” kin, from Gunnell et al. 2007. Obscure Eutherians of the Paleocene (OEP? OETP?) will be a long, potentially unfinishable series taking a look at some groups of obscure eutherian mammals from the Paleocene Epoch (hint: pretty much every group of the mammals from the Paleocene Epoch. I might give Hyracotherium a pass). I’ve been thinking about these critters in particular lately because I’ve been brought onto a project analyzing the skeleton of one of them, Aphronorus oreili, who just happens to a member of our family of focus today: the Pentacodontidae. Pentacodontids are an enigmatic group of early Cenozoic mammals united by just a few features, most prominently an enlarged fourth premolar in both the upper and lower jaws, which seems to form the apex of the dental row. They were originally placed in another family by Simpson (1937), the Pantolestidae (coming soon), but pulled out and elevated to familial status by Van Valen (1967), whom most subsequent researchers seem to follow. Four genera are generally included: Pentacodon, Aphronorus, Coriphagus, and Bisonalves (Gunnell et al. 2007). All appear to have subsisted mainly on insects and small vertebrates and are broadly classed with the primitive insectivores in the paraphyletic “proteutheria” (the Paleogene has a few of these kinds of groupings, “condylarthra” for stem ungulates being another). 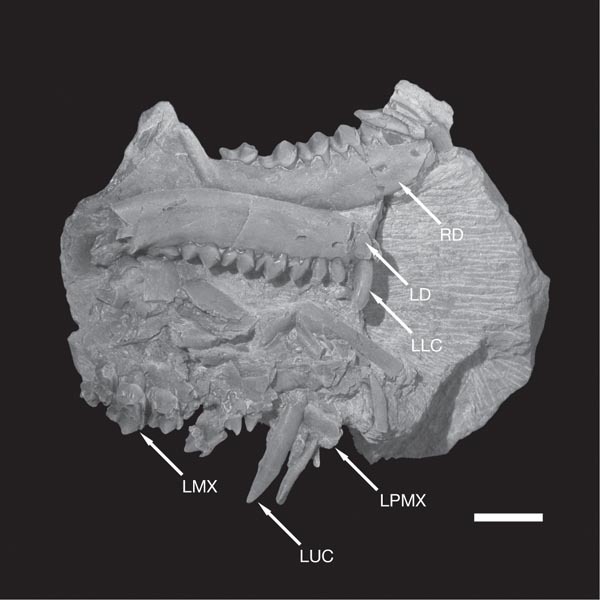 Cranium of Aphronorus oreili, USNM 309880, from Gingerich et al. 1983. Aphronorus (“crazy mountain,” for the site of its type locality in Montana) is known from five species: A. fraudator, A. ratatoski, and A. simpsoni, A. bearspawensis, and A. oreili, distributed though Utah, Wyoming, Montana, and Alberta (Gunnell et al. 2007; Scott et al. 2013). Although A. fraudator is the type species for the genus, A. oreili the best known, from the usual dentognathic material as well as a relatively complete cranium described by Gingerich and collegues (1983) and a substantial amount of skeletal material alluded to above and initially described by Boyer and Bloch (2003). Species of Aphronorus all appear to have been small to medium-sized animals (around 500g-1kg) that likely fed on some kind of fauna, although what exactly remains something of a question. USNM 15539, the type specimen of Aphronorus simpsoni, from Gazin 1938. Gingerich et al. (1983) emphasized the substantial wear present on the upper dentition of the UM 309880 cranium and likened this to the heavy wear known from some semi-aquatic pantolestids who are thought to have fed on shellfish (Dorr 1977). This might also explain the unusual expansion of the fourth premolar. Was it the mollusk-crushing tooth? The skeleton of A. oreili may not share many pantolestid specializations for semiaquatic life, however. Boyer and Bloch (2003) likened it to the tentative semi-fossorial adaptation seen in the earliest paleanodont Escavododon. Heavy dental wear is also known in some terrestrial insectivores, presumably due to exogenous grit in their diets, and this might be a testable alternative hypothesis for the condition in A. oreili and other pentacodontids. A. simposoni from first biochron of the Torrejonian (To1) of Utah is the earliest occurring species of Aphronorus. Another specimen only identified as A. sp. has been described from the probably latest Puercan (?Pu3) site of Purgatory Hill in Montana. A. fraudator and A. bearspawsensis extend from To2 into the Tiffinian (Ti4 and Ti1, respectively). A. oreili comes in at To3 and is gone after Ti1. Finally, A. ratatosky appears at To3 and persists until Ti2. The latest record for Aphronorus is a specimen tentatively identified as A. sp. from the earliest Clarkforkian (Cf1) of the Bighorn-Clark’s Fork Basin in Wyoming. This sequence implies the possibility of lineal relationships between some of these taxa, as well as significant sympatry at some sites. The details of these relationships also remain to be worked out. Pentacodon is the type genus for the family, and is represented by two species, P. inversus and P. occultus. Both species are known entirely from the Torrejonian of the San Juan Basin in New Mexico, although an occurance of Pentacodon sp. is recorded form Wyoming (Gunnell et al. 2007). Material for Pentacodon is scantier than for Aphronorus and largely dentognathic. They share an unusual enlargement of the fourth premolar, which presumably served a similar function in their dietary ecology as in Aphronorus. On average, Pentacodon is the largest genus of pentacodontid (average size of m2 = 4.5 mm; Coriphagus = 2.5 mm; A. fraudator = 2.7 mm; Bisonalveus = 2.6 mm [Gunnell et al. 2007]). P. inversus appears first in To2 and persists until To3, when it is sympatric in New Mexico with the slightly larger P. occultus. Pentacodon sp. from the Shotgun Local Fauna in Wyoming is significant in both extending the geographic range of Pentacodon north to the Central Great Plains and temporally into Ti1. Coriphagus is known from two species, C. montanus and C. encinensis (Gunnell et al. 2007). It occurs at many of the same sites and in the same interval (To2-To3) as Pentacodon and Aphronorus in New Mexico and Wyoming, and was probably similarly adapted to subsist on small fauna, with a long, slender mandible. Its teeth are robust, but seem somewhat less specialized than those of Aphronorus and Pentacodon, with less hypertrophy of the fourth premolar (Douglass 1908). Bisonalveus is represented by two species, B. browni and B. holtzmani, distributed around the upper Great Plains in sites dating from Ti1-Ti3, making it the last pentacodontid genus to arise (Gunnell et al. 2007). Like Coriphagus, it lacks the specialized last premolar seen in Pentacodon and Aphronorus, although the fourth premolar is enlarged and molariform (Fox and Scott 2005). What it lacks in premolar hypertrophy it makes up for in the specialization in its anterior dentition, however. 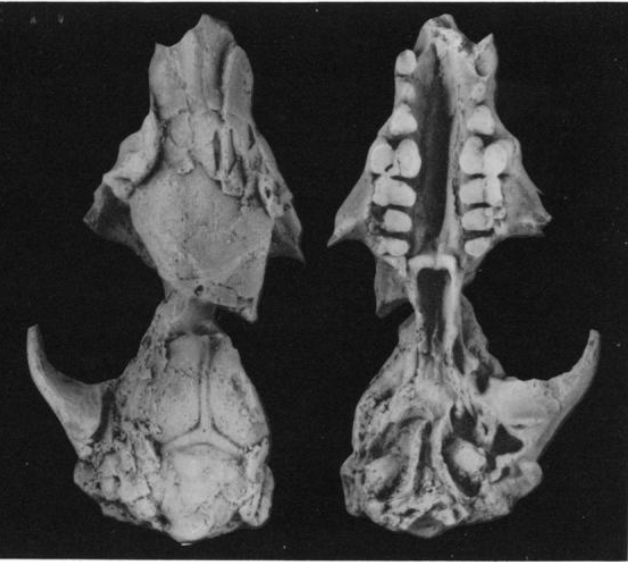 Partial cranium and lower jaws of Bisonalveus browni, from Fox and Scott (2005). The upper canine of Bisonalveus browni is marked by a deep, enameled groove on its anterior surface. This is matched by a relatively squat and premolariform lower canine. Fox and Scott (2005), in describing this novel anatomy, interpreted it as evidence for a venom delivery system, like that known for some shrews and solenodons. Shrews lack specialized hard tissue and simply chew venom from their saliva into prey, but solenodons have a enameled groove on the surface of a caniniform lower incisor. Fox and Scott (2005) argue that this represents a good functional analogue for the groove structure in Bisonalves, although the presence of delivery systems in different regions of the mouth indicate that they are not homologous and that venom delivery must therefore have evolved at least four times in mammals (shrews, solenodons, pentacodontids, and platypus). They further argue that the squat form of the lower canine is an adaptation for allowing the upper, fang-like canines to clear the gape of Bisonalveus and sink into prey. Detailed view of the upper canine of Bisonalveus browni, from Fox and Scott (2005). As one might expect, this hypothesis has had its detractors. Orr et al. (2007) and Folinsbee et al. (2007) point out the presence of canine grooves in several lineages of non-venemous mammals, including primates (particularly some large-bodied anthropoids), coatis, hippos, suiforms, and pteropid bats (they might have added red pandas to that list as well). 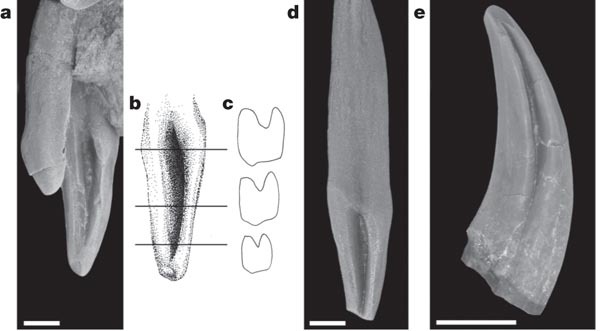 The structural similarity between the upper canine grooves of bats and Bisonalveus, with a similar shaped chamber toward the root of the tooth, is particularly striking. In contrast, solenodons constitute the only lineage of extant mammals to evolve both venom and dental grooves. The only other non-soriciform fossil synapsid argued to possess this adaptation is the Permian stem mammaliform Euchambersia, which differs from Bisonalves in showing not only an elaborated upper canine venom delivery system (with a completely enclosed tube) but apparent modifications to the cranium, including deep wells in the maxilla for expanded venom-producing parotid glands. Folinsbee et al. (2007) also dispute the statement of Fox and Scott (2005) that the upper and lower canines did not occlude in the region of the groove, identifying wear facets on both the medial and lateral ridges surrounding it. 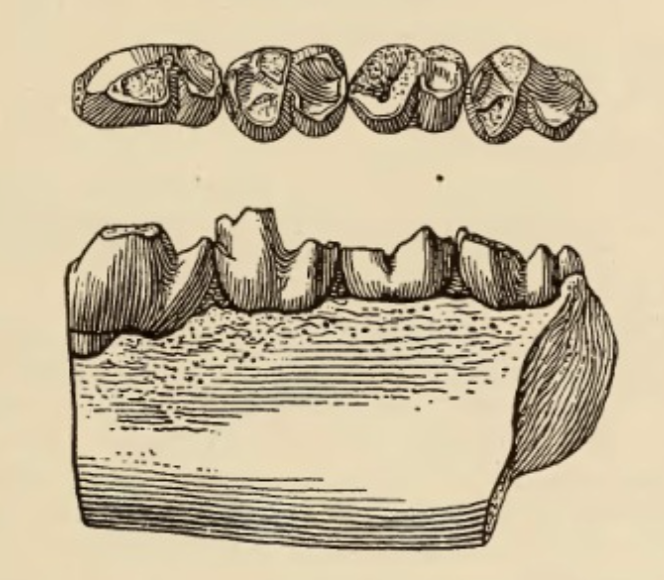 This suggests that the groove may have been function in some other way, perhaps in increasing the strength of the slender tooth by maximizing the volume of enamel. The upper canine groove of Bisonalveus may be analogous to the lower incisor venom delivery grooves in Solenodon in some, more precise aspect of its structure, but until this is demonstrated, the suggestion of Fox and Scott seems essentially speculative. B. browni is still one of the best known pentacodontids, however, and demonstrates clearly the adaptation for terrestrial small faunivory that seems to characterize the family. The biggest question when it comes to pentacodontids concerns their interfamilial relations. They have been conventionally classified either within or sister to the pantolestids, another group of small to medium bodied small faunivores from the Paleocene and Eocene, but as Van Valen (1967) noted, many of the detailed features they are believed to share with them, such as the unusually posterior position of the mental foramen under the first molar, are widely present in among “insectivorans.” He moots the possibility they may aline with another “insectivoran” group of early mammals, the lepticids, or even some members of the putatively proto-ungulate “condylarth” hypsodontids. Boyer and Bloch (2003) suggest affinities with a group known as the palaeanodonts, which are in turn generally allied with the extant pangolins. Ultimately only a broadly sampled phylogenetic analysis of early eutherian groups can give some resolution to this question, and hopefully, such a thing might be viewable from some fine journal of paleontology or mammalogy in the medium-term future. NEXT TIME ON OEP/OETP: Pantolestids probably? Boyer, D. M., and J. I. Bloch. 2003. Comparative anatomy of the pentacodontid Aphronorus orieli from the Paleocene of Western Crazy Mountains Basin. Society of Vertebrate Paleontology Annual Meetings. Dorr, J. A. 1977. Partial skull of Paleosinopa simpsoni (Mammalia, Insectivora), latest Paleocene Hoback Formation, central western Wyoming, with some general remarks on the family Pantolestidae. Contributions from the Museum of Paleontology, University of Michigan 24:281–307. Douglass, E. 1908. Vertebrate fossils from the Fort Union beds. Annals of the Carnegie Museum 5:11-26. Folinsbee, K. E., J. Muller, R. R. Reisz. 2007. Canine grooves: Morphology, function, and relevance to venom. Journal of Vertebrate Paleontology 27:547-551. Fox, R. C., and C. S. Scott. 2005. First evidence of a venom delivery apparatus in extinct mammals. Nature 435:1091-1093. Gazin, C. L. 1938. A Paleocene mammalian fauna from central Utah. Journal of Washington Academy of Science 28:271-277. Gingerich, P. D., P. Houde, and D. W. Krause. 1983. A New Earliest Tiffanian (Late Paleocene) Mammalian Fauna from Bangtail Plateau, Western Crazy Mountain Basin, Montana. Journal of Paleontology 57:957–970. Gunnell, G. F., T. M. Bown, J. I. Bloch, and D. M. Boyer. 2008. “Proteutheria”; pp. 63–81 in Evolution of Tertiary Mammals of North America, Vol. 2. Orr, C. M., L. K. Delezene, J. E. Scott. 2007. The comparative method and the inference of venom-delivery systems in fossil mammals. Journal of Vertebrate Paleontology 27:541-546. Scott, C. S., D. N. Spivak, and A. R. Sweet. 2013. First mammals from the Paleocene Porcupine Hills Formation of southwestern Alberta, Canada. Canadian Journal of Earth Science 50: 355-378. Simpson, G. G. 1937. The Fort Union of the Crazy Mountain field, Montana and its mammalian faunas. Bulletin of the United States National Museum. Van Valen, L. 1967. New Paleocene insectivores and insectivore classification. Bulletin of the American Museum of Natural History.